Want to make a mess with me? Come on out on October 3rd to The Gates of Presqu’ile! 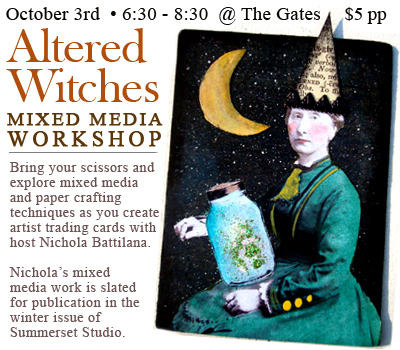 I'll be hosting a mixed media workshop, creating altered art artist trading cards. It'll be a load of fun. Call 613.210.0851 to reserve your spot :) Bring your own scissors and the workshop is just $5. Drat...I live to far away. And this looks like so much fun! Booo... I'm too far away too :(. I'm sure it will be a marvelous class. Dang! Would you consider offering it online?